Who is a Hindu? And who can access a Hindu temple? In several sections of Hindu society, those remain controversial issues, as illustrated by two recent incidents at the famous Jagannath temple, reported by our correspondent in Puri. The three Indonesian devotees leave the police station after verification of their Hindu identity (© Jagannath Dasa). 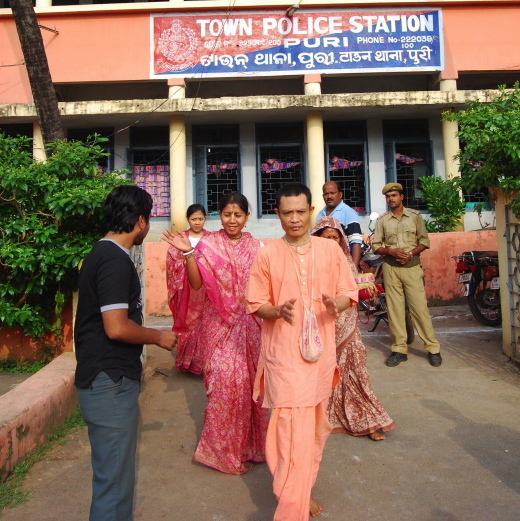 Chaos prevailed in the Jagannath temple at Puri on 7th November 2007, following the presence of three Indonesia-based International Society of Krishna Consciousness (Iskcon) devotees, including two women inside the shrine precinct. A group of temple priests alleged that the trio was non-Hindus. The 12th century Jagannath temple does not allow non-Hindus into its premise. However the three pilgrims, who were detained by the police for their religion verification, were let free once it was “officially” verified that they were Hindus. The Jagannath temple police inspector Gyan Ranjan Mohapatra browsed through the devotees’ passports and identity cards provided by Indonesia government. “It was clearly written on their identity cards that they were Hindus. So there is no question of disturbing the pilgrims for further inquiry, ” said the inspector. According to police, the three devotees belong to Iskcon community in Bali in Indonesia. They have been identified as Kadambari Das, Arjun Putra Das and Rupadeep Draupadi. “The three went into the Jagannath temple with Mahabahu Das, a local devotee from the Iskcon temple at Bhubaneswar in Orissa. The trio had the glimpse of the sibling deities (Jagannath, Subhadra and Balabhadra) and saw the morning aarti [offering of light], ” said the cop, Mohapatra. “Some priests meanwhile, noticed them and questioned about their identity and religion. While the three devotees could not understand the local language, the local devotee Mahabahu Das from Bhubaneswar also could not give any satisfactory answer to the priests about the religion of the three Indonesians. That had angered the priests, who then brought the three devotees near the police, ” Mohapatra informed. Meanwhile, the police and the three devotees denied of being heckled or booed by any priest inside the temple during the humiliating ordeal. Quizzed, Kadambari maintained that she and her two companions are Hindus. “Not just Hindus, we are original and born-Hindus. We are not converted Hindus. It is really a horrible experience for us despite having identity cards that proved our religion, ” a rather perturbed Kadambari said. “Most of the residents in Bali are Hindus and great devouts of Lord Jagannath. Our forefathers used to come very often to Puri Jagannath temple. They had not faced any sort of trouble at Puri. But we faced problem by priest on our maiden visit to the hallowed city, ” said Draupadi. The two Indonesian women pilgrims were obviously perturbed by their experience (© Jagannath Dasa). The devotees also claimed that the then Gajapati Maharajas in Puri have often visited Bali and invited the Bali residents to visit Jagannath temple at Puri. “We have a big Jagannath temple at Bali. The Puri King can vouch for our religion very well, ” said Kadambari. Meanwhile, this incident came close on the heels of a religious storm that had kicked off in the temple town following the entry of an American national into the Jagannath temple on 1st March, 2007. The American national, Paul Roediger (a non-Hindu) sneaked into the Jagannath temple on that day before being caught by some priests, who handed him over to police. He had then no idea that the Jagannath temple is out of bounds for non-Hindus. Paul then had to pay certain amount of fine money before he was allowed to go. Priests also had put the blame squarely on police arrangements. Lord’s Mahaprasad worth lakhs of rupees was dumped as priests claimed that those Prasad had become defile [“prasad” means here food offering to God, subsequently distributed among faithful]. The daily rituals at the temple on that day came to a halt for hours together. “However, nothing of that sort happened this time. The priests became calm after knowing that the three Indonesians are Hindus. Rituals went on smoothly in the temple, ” police inspector Gyan Ranjan Mohapatra said. On the same day, police detained two Muslim youths, who entered into the Jagannath temple by defying the shrine’s age-old norm that allows only Hindus into its precinct. The two youths have been identified as Mohammad Wasim Asgar (18) and Aftab Allam (19), both residents of Biramitrapur in the Sundergarh district in the state, police said. “A temple priest identified the youths as Muslims by seeing some sort of Muslim symbols in the necklaces worn by the two boys. The duo was caught while ascending the twenty-two steps in the temple. When we enquired, it was revealed that they were Muslim. It is further revealed through inquiry that none of them are having any sort of criminal background, ” said Jagannath temple inspector. “The youths said they were unaware of the temple rules which do not allow non-Hindus, ” Mohapatra said. The temple priests in the meantime made a dig at the police for poor security arrangement at the main entrance of the temple. “Incidents of this type have been taking place time and again. Non-Hindus and a number of miscreants are smoothly taking their way into the temple by challenging the heavy security barrier at Lion Gate, the main gate of the temple, ” said Damodar Mahasuar, a temple priest. While the priests were little reactive on the presence of three Indonesia devotees, they were pretty enraged over the entry of two Muslim youths inside the temple. “It is okay that the identity of the Indonesians created some sort of confusion, which later was sorted out through their identity cards. But we don’t think the Muslim youths entered into the temple ignorantly, ” said Somnath Khuntia, another priest. “The two youths belong to Orissa. It is shocking that the two youths told police that they were ignorant about the temple rules. And I don’t think the people of the state would be in darkness about the entry rules into the Jagannath temple” said Shyamsundar Mohapatra, a priest.